The next day, Stephen and Msimangu continue to search for Absalom. They catch a bus after Msimangu assures Stephen that they cannot catch a wrong one, for they all go into Johannesburg. Then they try to catch a bus to the neighborhood of Alexandra, which is where they believe Absalom to be. The fact that every bus leads to the city reinforces the idea of Johannesburg as an inevitable force, into which all are drawn and destroyed. A man approaches Stephen and asks him and Msimangu to reconsider taking the bus, because they are trying to do a strike to bring the bus fare back down. After some discussion, the men agree not to take the bus. After he leaves, Msimangu reveals that he is a friend of John’s, and an organizer of these types of political actions—also a man who has rejected the church. They begin to walk to Alexandra. After a while, a white man stops and offers them a ride, which they take. He takes them to where they need to go, drops them off, and leaves. The political situation of Johannesburg becomes clearer and clearer. Though the men who fight against injustice are well-intentioned (John, the man who encourages them not to take the bus), they are still trapped in the same corrupting system. As they walk through Alexandra, Msimangu tells Stephen about it, and how it is a place where black men can own property, but it has no services, and harbors a lot of crime, some of it very dangerous. He regales Stephen with stories of people robbed, beaten, assaulted. He says that people from neighboring communities, horrified by the crime, petitioned to destroy the whole place, but that other white people intervened, saying that it was important for black men to be able to own a home, and have a say in a community. The whites of South Africa have created an untenable situation: they removed blacks from their land, become upset when suffering blacks seek money and security or express their rage, discuss dismantling even this artificial community that cannot exist anywhere else, but then decide that it must be allowed to exist because the community is stabilizing—even though whites dismantled the real community in the first place. They finally arrive at the house. The woman inside reluctantly lets them in. She says that Absalom and his cousin have been gone for a while. She is reluctant to answer questions, insists that nothing is wrong, and is obviously afraid. The men leave. Outside, Msimangu suggests that both of them may have been too many to question her, making her nervous. He leads Stephen away, and then returns to the house. The situation is so bad in Johannesburg that people don’t even trust two parsons. These people have been so broken that they cannot put faith in the church or in their own people. Msimangu assures the woman that he is not from the police. He presses her for more information, telling her that Stephen is an old man who is suffering, and that they are only seeking Stephen's son. The woman still refuses to talk. Finally, Msimangu agrees to swear on a Bible that they are only looking for Absalom, and will not bring misfortune down upon her head. After this, she reveals that the boys had lived there, and dealt in likely stolen goods, though she never noticed any blood. She repeats that they have been gone for a long time and she doesn’t know where they are, but that they knew a taxi driver. She tells them how to find the taxi driver. Msimangu learns more details about how far Absalom has fallen, and how much danger he is in. Again, he knows more than Stephen—but, living in Johannesburg, he understands the situation more clearly than Stephen can, at least for now. They seek out the taxi driver and ask him about Absalom. The driver seems very afraid. After Msimangu explains why they are seeking out Absalom, the man tells them that he is in a shantytown. They thank him, and take his cab back to Johannesburg. The trail of Absalom has only led in a downward spiral: respectable district, crime-ridden district, and now to a shantytown. On the road, they see the people boycotting the buses making the long walk. Police officers try to dissuade white people from giving the black people rides, which some do. As they drive, Stephen thinks about the kindness of these white people and smiles. Msimangu is also taken with it, but more fiercely. Stephen and Msimangu’s conflicting views on the kindness of white people reveals that the motivations are similarly complicated. What does it mean when people who have done a great, overarching evil do a small thing of kindness? What kind of repayment is that? Machado, Carmen. "Cry, the Beloved Country Book I, Chapter 8." LitCharts. LitCharts LLC, 5 Aug 2013. Web. 18 Jan 2019. Machado, Carmen. 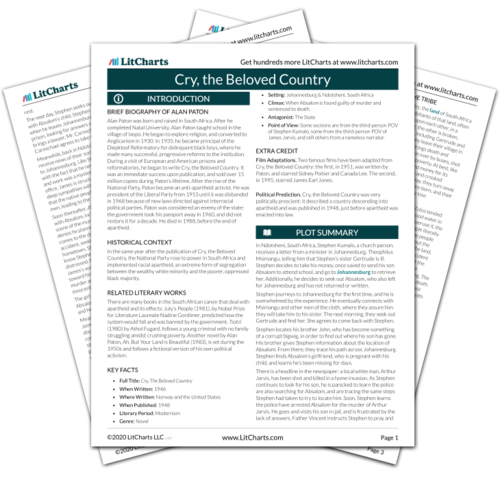 "Cry, the Beloved Country Book I, Chapter 8." LitCharts LLC, August 5, 2013. 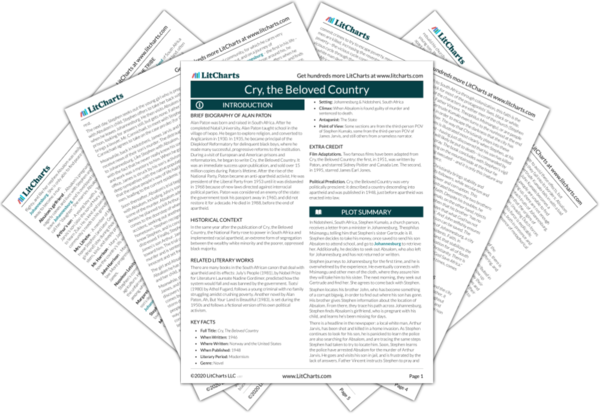 Retrieved January 18, 2019. https://www.litcharts.com/lit/cry-the-beloved-country/book-i-chapter-8.